Do you remember that cute little girl in the Hanuman movie? Well, probably not as many years have passed since then. That little girl, at age 8, made her acting debut with this mythological movie. Today, that sweet faced girl is known as Nithya Menon – the famous South Indian actress! Even at the tender age of 8, Nithya Menon had shown immense potential and one must say that she has lived up to her potential for sure. This cherubic actress studied journalism and was interested in becoming a film maker; but instead landed in front of the camera – to the good fortune of all her fans! 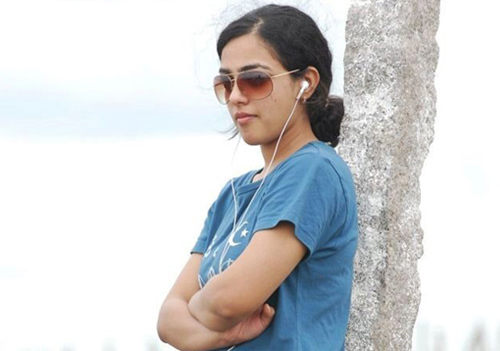 Apart from being a wonderful actress, Nithya Menon is also a very good playback singer. A talented musician and an acclaimed actress – Nithya is definitely one in a million. Another endearing quality Nithya Menon possesses is that despite belonging to such a glamorous profession, she has maintained a simple persona. 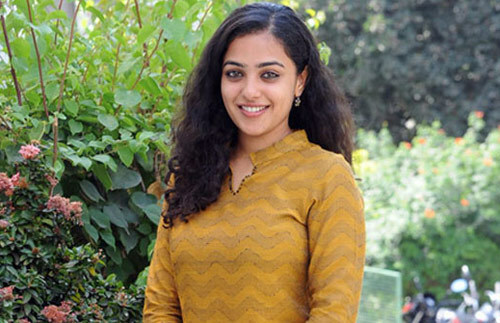 Down to earth in her behaviour and get-up, Nithya is seldom spotted in dark, heavy make-up or fancy designers attires. But even without makeup, this dusky beauty stands apart. Don’t believe me? Check out these Nithya Menon no makeup photos for yourself! You can easily see in this picture how decent Nithya is looking in this simple kurti, which is highlighting her innocent face. This picture definitely proves that one can look amazing without layers of make-up! This is a really beautiful picture of Nithya without makeup. Her only accessory in this picture is her innocent smile. Notice how genuine her smile is? This definitely is not an ‘only for the camera’ look. This is a picture of Nithya Menon looking ravishing in a traditional avatar. Nithya has confessed many times that she prefers to dress desi when away from the movie sets. For Nithya, ‘simplicity is definitely the best policy’ as far as fashion is concerned, that is! Dressed in a simple top with simple earrings, this look epitomizes the phrase down to earth. Nithya is definitely a role model for all the young girls out there. Now this picture will shut all the naysayers out there. See, Nithya can carry trendy well as traditional! Here, you can also understand her love for music. Many critics slam her so called ‘boring’ personality. But does this picture show a boring person? Here is a young girl who knows her mind and body and refuses to follow trends. Our kind of girl! Another hidden aspect of Nithya Menon comes to the fore in this picture. Whenever she gets time, Nithya indulges in gardening. Gardening can be therapeutic after hectic shooting schedules. But even in this mundane set-up, Nithya looks beautiful! With this picture you can easily have a glimpse of how down to earth she is. Unlike others who love to flaunt their big gizmos, Nithya here is seen happy with her ordinary mobile. Makes us love her more for being so ‘like us’. Nithya is an easy to go person. You can see her simple hairstyle in this picture which is giving her a glamorous look. People usually say that it is with help of fashion that most actresses manage to look so ravishing. That definitely is not the case with Nithya Menon. She has natural beauty, and she does not need much make-up most of the times. Well, the beach story is common for all of us. Stars sport trendy bikinis for their movie shoots but that is not the case with Nithya, who does not like to wear the usual beachwear. This picture should be an encouragement to people who despair about what to wear on a beachside. Wear what you are comfortable in-be it a bikini or something else. This an ‘awww’ inspiring picture, don’t you think? Here is a famous actress, de-stressing, at an award ceremony. Again, Nithya’s simplicity shines through here. For all the Nithya Menon fans out there, tell us what you thought of this list of Nithya Menon without makeup pictures? Or are you a fan now? Do leave us a comment!